James or Jordan? LeBron or Michael? LBJ or MJ? This topic has been debated to death on talk radio, on podcasts, and in print. Michal Jordan is considered by many to be the best basketball player of all time. LeBron is the one current player who some think could challenge MJ for G.O.A.T. status. I believe the debate itself is a bit short-sighted since it completely dismisses other all-time greats like Kareem, Bird, Magic, Russell, and Chamberlain. Each of the guys mentioned in the last sentence, as well as MJ and LeBron, could lay claim to best-ever status. They all have countless great moments and statistical accomplishments that would bolster their case. They also have minor flaws that we could point out if we wanted to get nitpicky. This article is about LeBron and Jordan though, and I think now is the right time to compare them. They both completed 15 seasons in the NBA so LeBron is at the same place in his career as Jordan was at his third and final retirement. They have each had 15 chances to win a championship, be the MVP, be an all-star, lead the league in scoring, or do whatever else great players do during the course of their career. I will do my best to lay out the case for each guy and point out any factors that I think are important in this discussion. I have been watching basketball since 1982 so I have been a witness to both of their careers in their entirety. I can’t stand hot takes so you won’t find any here. If you are looking for an article that takes an EXTREME position or ignores all facts that go against a predetermined narrative you are in the wrong place. There are plenty of “experts” on Facebook and Twitter (not to mention Fox Sports, ESPN, or sports talk radio) that can provide that for you. I will also attempt to avoid any recency bias and getting swept up with what is happening now while forgetting about the past. That is never a good thing and too many are guilty of it. At the same time, I am not a “get off my lawn” type person. We tend to idealize the past and overlook its flaws. The sport of basketball did not magically peak in 1986 and then go downhill from there. So if you are looking for someone who will say that everything and everybody was better in the 1980s you need to keep looking. With that out of the way, let the comparison begin. The more simple-minded among us would say that Jordan won six titles and LeBron won three, therefore Jordan is better. Case closed. It should be obvious that this is a very incomplete way to judge greatness in a team sport. Bill Russell won 11 titles. He is clearly the greatest if all we are doing is counting championships. Some may argue that Russell played in a different era so it is not fair to include him in this discussion. Robert Horry (a contemporary of both James and Jordan) won seven titles. I guess that makes him the greatest player of the modern (post-merger) era. No, no it doesn’t. Titles are important and are definitely part of the equation, but they should NEVER be the single overriding factor when determining individual greatness in a team sport. This is not golf or tennis so let’s stop pretending that it is. Others argue that the fact that MJ was 6-0 in his finals appearances while James was 3-6 should settle the argument. This group is even dumber than the “championship counters” discussed in the previous paragraph. On what planet is making the championship round of your sport and losing somehow a lesser accomplishment than not making it at all? Continuing this flawed line of thinking it is better to be swept in the first round of the playoffs (in order to preserve a perfect finals record) than to lose in game 7 of the finals! This makes absolutely no sense and I reject it out of hand. A player is awarded points for how far his team advances in the playoffs each season. Missing the playoffs altogether is worth zero points. In the NBA where 53.3% (this % was higher when Jordan played because there were fewer teams) of teams make the playoffs it is not a great accomplishment simply to make the postseason, so for a great player to miss out altogether is something of a failure. Losing in the first round is worth 1 point. Losing in the second round is worth 2 points. Losing in the conference finals is worth 3 points. Losing in the finals is worth 4 points. Finally, winning the title is worth 6 points. Titles do matter so a bonus point is awarded for that accomplishment. 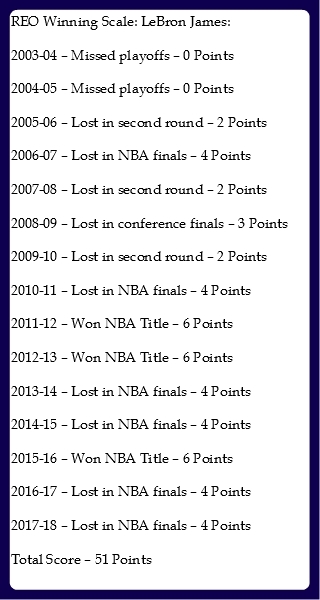 By this measure, LeBron has a slight edge in terms of his impact on his team winning over the years. His REO Winning Scale™ point totals will only go up as his career continues since he appears to not be slowing down or conceding anything to age. We must also acknowledge that Jordan retired briefly during his absolute peak and retired again at the very end of his prime. Those lost seasons would have almost certainly produced more playoff success and possibly even more titles. Another factor to consider is that each of these players played in at least two different eras of basketball. Jordan entered the league when scoring was high and the pace of play was fast. His rookie year the average NBA team scored 110.8 points per game. That season (1984-85) every single team in the league averaged over 100 points per game. By the time he retired the game had slowed down considerably and become more physical. Scoring was way down across the league. During his final season with the Bulls league-wide scoring was at 95.6 points per game and his final season with the Wizards saw scoring drop to 95.1 per game. LeBron came into a very slow paced and physical league, but the pace of play has increased dramatically in the last decade and scoring has as well. Watching a game from LeBron’s rookie year compared to a game now is almost like watching a different sport. LeBron’s rooking year saw team scoring at a near-record low of 93.4 points per game (the second lowest total in 60 years!). There were only two teams in the entire league that averaged over 100 points per game and four teams averaged less than 90. This season scoring reached a nearly 30 year high of 106.3 points per game. We should also note that when Jordan played hard fouls were not discouraged the way they are now so players were physically more beat up. On the other hand, Jordan never had to deal with constant switching on defense or with zone defenses which were illegal at the time. LeBron has faced legal zones and much more sophisticated analytic based defenses for his entire career. I say all that to point out that one guy did not “have it easy” while the other had to “work for everything he got.” Those who say such things are either very biased or willfully ignorant. This analysis would be incomplete if we didn’t compare the level of competition. Jordan entered a very deep and stacked league. With a 16 team playoff field in a 23 team league it was easier to make the playoffs then, but harder to advance. For this reason, MJ went 1-9 in his first 10 playoff games and lost three series before he ever won one. As his career went on and his teammates got better he started winning more. The arrival of Jordan’s prime coincided with the decline of the Lakers, Celtics, and Pistons dynasties that dominated the early part of his career. As those teams and players got older the Bulls took advantage. The league also expanded very rapidly in the late 80s and early 90s going from 23 to 29 teams. The talent pool was spread out and the league was watered down. In addition, many young players were going off the rails as the absence of a salary cap for rookies killed the incentive to get better. The mid-90s through early 2000s when Jordan did much of his winning was not a good time for the NBA in terms of style or quality of play. Jordan’s Bulls were the primary beneficiaries of these events. LeBron never was able to take advantage of excessive expansion as only one new team has been added in the last 20 plus years. He also played during the massive influx of excellent international players that was just getting started when MJ played. These international players increased the depth and level of competition around the league. Perhaps the biggest thing working against LeBron is that he had the misfortune of playing the latter part of his prime during the Warriors dynasty. He was able to beat them once in the finals, but one team with four of the top 20 players in the league is unheard of and considerably more difficult than anything Jordan ever faced in the finals. One benefit for LeBron is that he has been aided by playing in the weaker conference for his entire career so making repeated trips to the finals has been easier for him that it was for MJ. Another way of to look at this is that Jordan faced tougher competition on his way to the finals, while LeBron has faced tougher competition in the finals. This would help explain why one guy has more finals appearances, but the other has more finals victories. Numbers Never Lie, But Do They Settle Anything? Jordan was a better scorer. LeBron a better rebounder and passer. This is true both in the regular and postseason. As he ages, LeBron’s per game numbers will almost certainly go down (assuming he is human) while his name will climb higher on the all-time record book. After 15 seasons each though, the statistics for both the regular season and playoffs are incredibly close. As we wrap up this article I should be forthcoming and admit that I never really rooted for either guy. I was never a Jordan fan during his career. While I did root for him to finally win a title when they played the Lakers in 1991 (a lot of that was due to how much I hated the Lakers), I did not enjoy seeing him win throughout the 90s. I have never rooted for LeBron in any of his 9 trips to the finals. I don’t hate his teams nearly as much as I did Jordan’s Bulls, but I have always pulled for whoever his opponent was. I do recognize that both are all-time great players, so hopefully, my lack of fandom for either player will make me unbiased in this analysis. So where does this leave us? Each guy had a similar impact on their team winning as evidenced by their REO Winning Scale™ scores. Both guys dealt with and conquered whatever the league threw at them in terms of style of play, pace of play, defensive rules, and physicality. They were both beneficiaries of certain peculiarities that were happening in the NBA during their careers, but they also had some bad luck in running up against all-time great teams that prevented them from winning as much as they could have otherwise. My take is that at his peak Jordan is still the slightly better player. His ability to seize the moment and his more consistent shooting touch gives him the edge. It also helps that he has no black marks on his resume like James has from the 2010 and 2011 playoffs. Even when Jordan lost in a playoff series he still played well. LeBron doesn’t seem to be slowing down one bit though. He is now 33 years old and has been playing a full NBA schedule since he jumped straight from high school 15 years ago. Somehow he seems to be getting better as he ages. If he can continue to put up comparable numbers to what he has done so far in his career and make a couple more title runs this debate will need to be revisited.